Grow your online presence by our Social Media Marketing techniques. Our techniques will save your time and will generate maximum results. 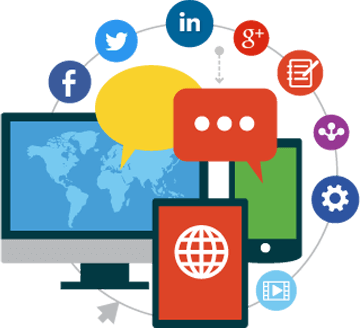 Our SMM services like lead generation, improved website traffic and awareness will ultimately help your brand to capture the attention and trust of potential buyers. We work on various social media platforms like Facebook, Twitter, Google+, Instagram, Pinterest, LinkedIn and many more, to spread your message through numerous networks, including the benefits of Blog Promotion, Social Networking, Customer service to your potential customers, Google rankings etc. Our Social Media Marketing team initially works upon unique yet informative content which holds the interest of current users, and then we interact with them. Our daily management and posts will help you reach new customer base and you will realize the increase in genuine followers. Facebook, Twitter and Instagram management.